Captain America talk! Welcome! My name is Jesse Deitz and I am writing a blog as part of the group initiative the father of this website created (Olaf Lesniak) #SJWCramSpam. We call ourselves Watchmen after the brilliant comic written by Alan Moore. Now, keep in mind this post was scheduled before the release of Secret Empire so, if anything sounds a bit off, keep this in mind. Like I said earlier Captain America comics have always had political commentary on the times, as have lots of other comics. Currently the commentary from Spencer is very one sided. Now obviously a comic can not just sit there and debate both sides of the argument I get that and the writer probably does not want to defend what he does not agree with. Also I know the first thing people are going to say in the comments is, “Every writer is biased,” The problem is the way he went about doing it. Here are some examples. 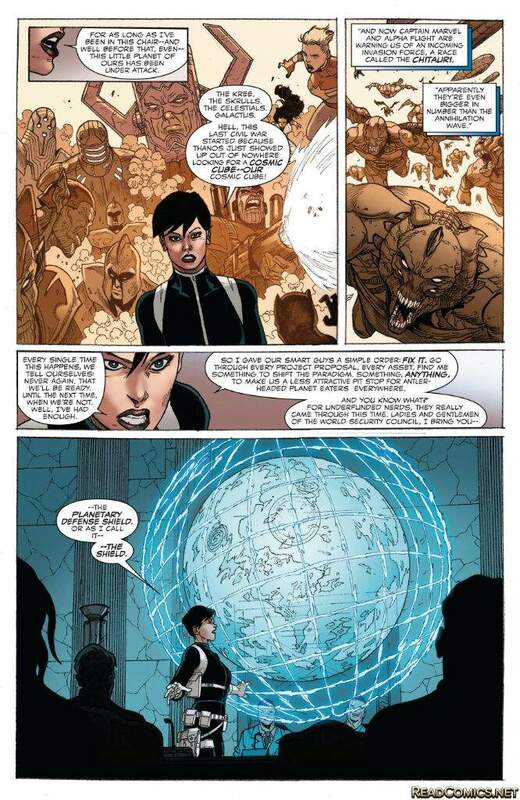 In this panel from the Red Skull’s speech we see what looks looks like just another supervillain rallying his troupes and justifying why they are doing whatever it is that they are planning. After reading more carefully you might notice some things that sound a little bit like things you might hear about in America today. 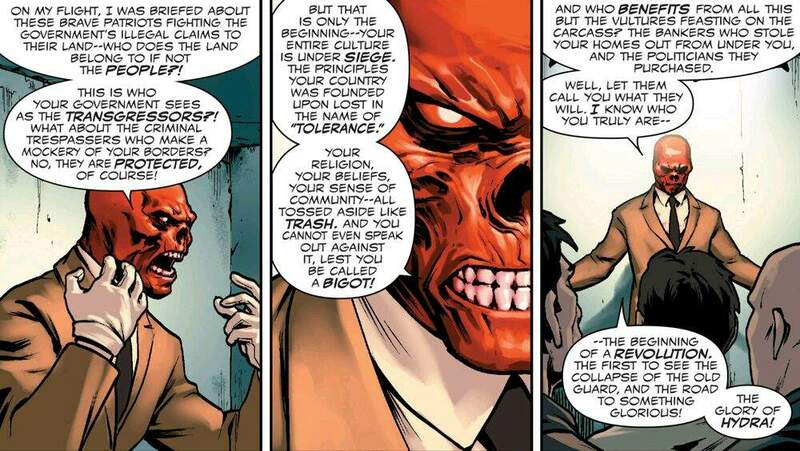 Talking about these things through the Red Skull is Spencer’s way of vilifying those who think this way whether it be Republicans, Conservatives, or anyone else who might have these thoughts. Now in this panel we see what is what I think is an unnecessary back story for a suicide bomber that Cap was trying to stop just for the sake of craming his political thoughts on us. Spencer goes out of his way to mention things like that the bomber never had anything against minorities. 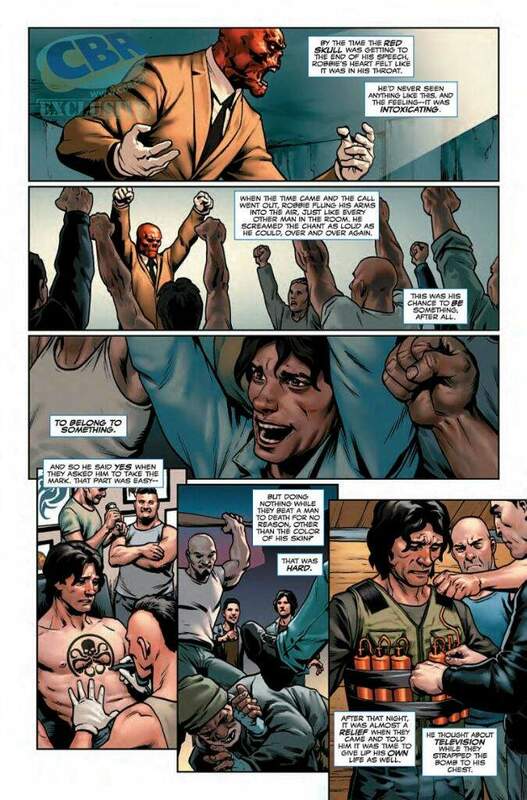 Also that when he went to prison and met the white supremacists, who of course work for Hydra. Next the bomber joins and of course the first thing they go out and do is beat up a guy just because he is black. I am not condoning their actions but, showing that the writer is using symbolism to show what he thinks of the people who have different political opinions. Now all of this just a back story for a person that was going to die and had nothing to do with the rest of the story except to to get the writers opinion across. Do I agree with Spencer’s views, for the most part no but, it is OK people can disagree and it is alright to have your own opinion because everyone does. The problem is making the people that do not think the way he does out to be evil humans. Are there some really bad people out there sure but, most people are not that way. There has been a lot of division in the world in recent years, America in particular, and writing things like that is not the way to bring people back together. 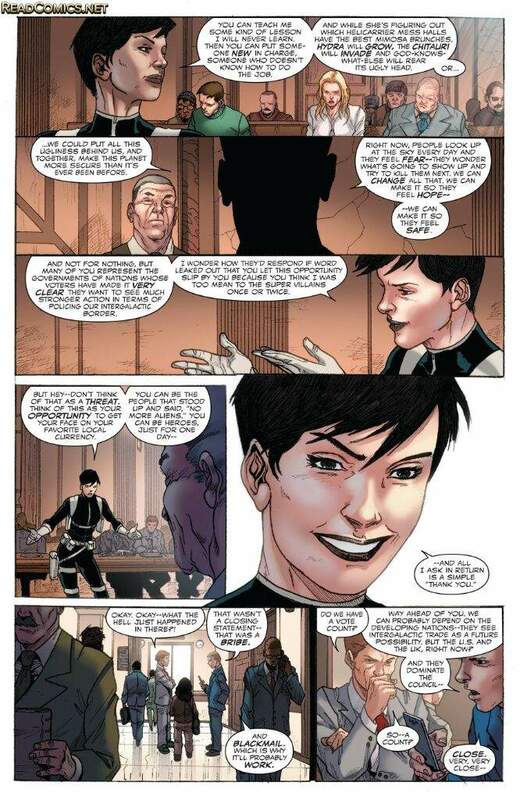 Part of what makes things like political commentary in comics good is when the writer can add it in a way that is subtle enough that people don’t recognize it right away but, when look closely you can say I see what you did there. Does this happen in Steve Rogers Captain America, no. The writers thoughts are all through out the stories and not hidden at all. That is one of Nick Spencer’s problems. If he could just try and not throw it all in your face and focus more in crafting the story with his thoughts weaved throughout neatly. There is nothing wrong with modeling comics with what is happening in the real world but, it is important to do it the right way. 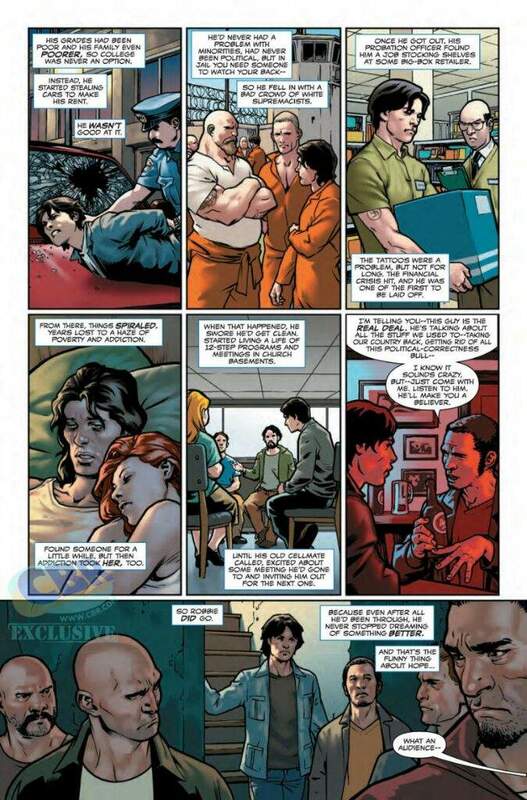 Most people don’t want to hear the same thing they saw on the news in the comic. 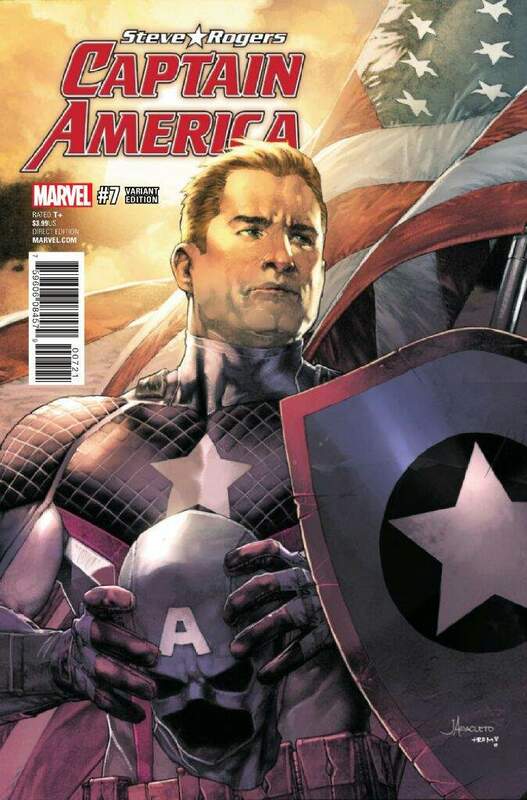 While not all of Steve Rogers has bad stories it certainly suffers at times. This is due to the fact that I think they get to far away from what most people like to read in superhero comics. 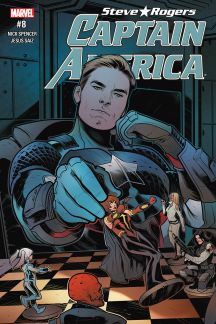 They had an opportunity with this comic to make it more of a spy or secret agent kind if book and saving the regular kind of Captain America stories for Sam Wilson’s comic. Now that is just something I would have liked to see. What we get is not really anything exciting or action packed. With there being a lot of flashbacks to establish what Steve thinks happened in his past, although I believe it is setting up new villain. The biggest problem for me is the subplots, they seem at times completely unrelated to the main story and helping it move along. Here is an example. This might just be my conspiracy mind at work but, does this space wall not sound a little bit like a certain real life proposed wall? Maybe that was just me. Now as of issue 13 I have not found how this wall is relevant to Cap’s story so, why did Spencer feel it necessary add it in here? It is things like this that make me wonder what they are doing when writing these things. Of course maybe it could come into play during Secret Empire or some other story arc down the line. 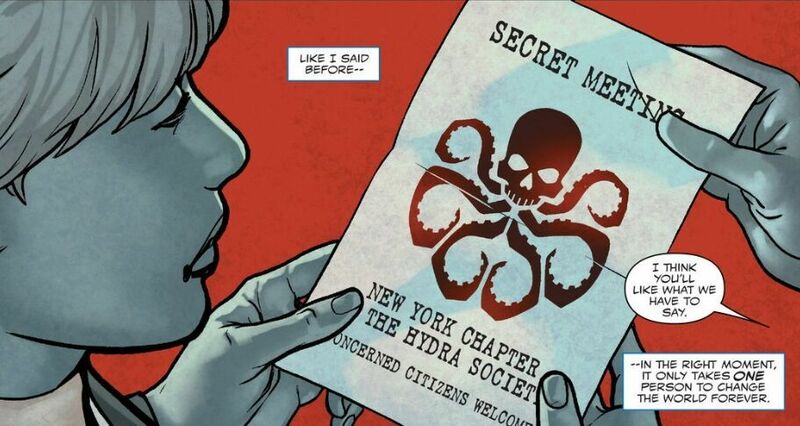 Also I wonder why do they spend so much time making the back story for Hydra Cap? 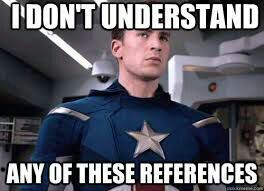 I can see using a few flashbacks just to get a little bit of what Steve thinks about being with Hydra. If he is going to revert back or possibly even die in Secret Empire why develop so much story that eventually won’t matter? My thoughts on the story could be me just nitpicking but, it does make me question their decisions. 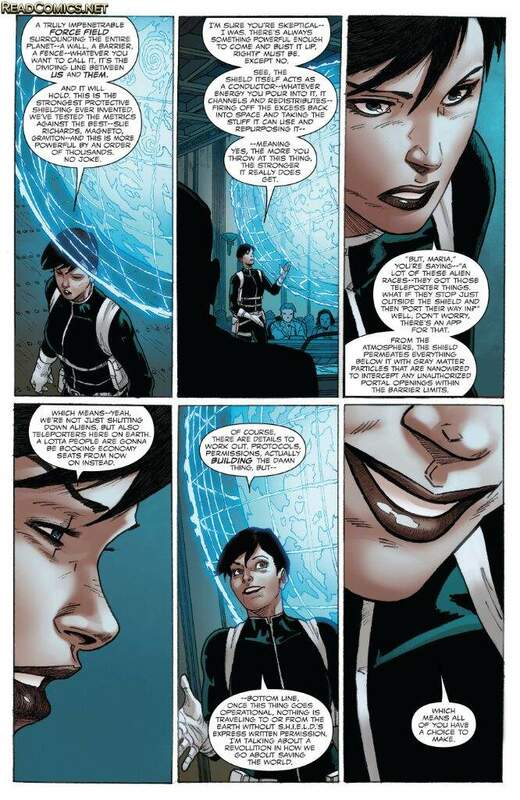 Despite what I have said there are still plenty of things I like about the comic. First being is how they portray Steve Rogers. 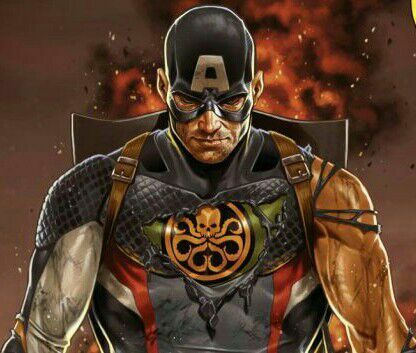 Despite the fact that he thinks he is Hydra you can still see the Cap everyone knows and loves in there fighting. You can tell he knows something is wrong and that is why even though, him being Hydra, he still is against the Red Skull. 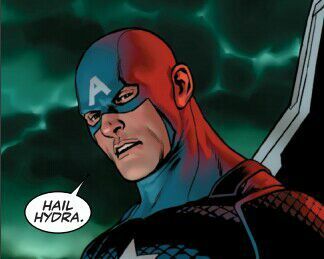 The concept of Cap being Hydra is also an interesting plot. If done right could be a good story arc, unless you kept him that way then absolutely not. Being as it is still going on I can’t say for sure if it will be a success but, it has the potential to. Will will have to wait and see how Secret Empire wraps up. In closing I would like to say that ultimately Steve Rogers Captain America is a decent read and one I have a subscription to. There are definitely turn offs that frustrate me sometimes but, I can still read it. I hope you will continue to support my fellow Watchmen as we continue this initiative. We knew going in that this would rub some people the wrong way but, ultimately we all want good stories with our favorite characters. We are all for good diversity as long as it does not compromise the story. Maybe one day we can just talk about comics without having to argue amongst ourselves about what is in them. Until then thanks for reading.